With spectacular Jiu-jitsu, unorthodox striking, and an iron chin, “Big” Ben Rothwell is one of the scariest men in the heavyweight division. At 36-9-0 Rothwell has had no shortage of incredible wins. With his April 10th bout against Junior Dos Santos looming, now is the perfect time to look back. From crazy knockouts, comebacks, dance moves, and cringe-worthy speeches here are “Big” Ben’s top five fights. 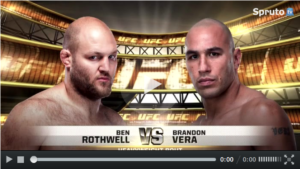 At number five Rothwell took on Brandon Vera at UFC 164. This was one of many fights in which the Kenosha, Wisconsin native had his chin tested. Vera caught Rothwell with numerous well-placed and clean shots: color commentator Joe Rogan remarked, on a replay of a particularly hard punch, “Rothwell ate that like it was a sandwich”. At around 3:40 of the third round begins my personal favorite Rothwell moment. It is at this point that he begins channeling or emulating Clay Guida. By mimicking the constant movement and bouncing style of “The Carpenter”, Rothwell was ultimately able to earn the TKO finish. At number four comes the inaugural appearance of the go-go choke. In their June 6, 2015 bout, Matt Mitrione’s ill-fated takedown attempt would be the platform on which Rothwell preached his new message: a warning to those who wish to bring the fight to the mat. The go-go choke is an apparently modified ten-finger guillotine that puts tremendous pressure on the throat and Adams apple. From the urgency with which Mitrione tapped, it is fair to say the go-go choke is one of the most excruciating submissions in the game today. It is safe to say you don’t want Rothwell anywhere near your neck. Rothwell’s fight against Brendan Shaub was a perfect example of what happens when you corner an injured animal. Shaub caught Rothwell with a beautiful spinning elbow that had him clearly shaken. It is often said that fighters show their true colors when they get hurt and that was evident in Rothwell’s finish immediately thereafter. Schaub’s mistake was pressing Rothwell up against the cage with little regard for his power. This time it was Rothwell’s left hook that finished the fight and left the Denver native climbing the invisible ladder. In Rothwell’s 45th bout he drew the veteran and perennial top ten fighter Josh Barnett. Before the UFC on Fox 18 card, Rothwell was expected to keep the fight standing, after all; no one in their right mind would attempt to grapple with the “Warmaster”. Yet, Rothwell proved, without a fraction of a doubt, that the go-go choke is not only here to stay, but it is effective against all caliber of opponents. If Matt Mitrione and Josh Barnett are any indication, no one’s throat or, more specifically, their Adams apple is safe. If we have learned anything from Rothwell’s resume it is that he has a penchant for beating opponents at their own game. Before choking out grappling legend Josh Barnett, Rothwell knocked out former K1, Dream, and StrikeForce Champion Alistair Overeem. Unsurprisingly, Rothwell came in as a big underdog in the Fight Night 50 card, but his KO by way of an overhand right gave notice to the odds makers, fans, and heavyweights alike. Many will remember this bout because of Rothwell’s post-fight dance. It has become a favorite gif, video, and clip, subject to endless remixes in the MMA community. It is too bad the man with the best seat in the house, Alistair Overeem, was too daze to enjoy that must see moment.